This post first appeared on Puddletown Reviews. However, the content and Susan Orlean’s writing makes for a beautiful essay. I felt it should be posted here as a new resource for writers of nonfiction. Here is my story, please listen; here I am, please tell me your story. Disclosure: My thanks to NetGalley and Simon Schuster for providing an ARC of The Library Book for my reading and reviewing. Opinions expressed here are mine. From the first time I walked into the East Nashville Public Library with my dad, I have been in love with libraries. He had already presented me with books that captured my heart. The daughter of a printer-publisher had no chance when it came to printed matter. 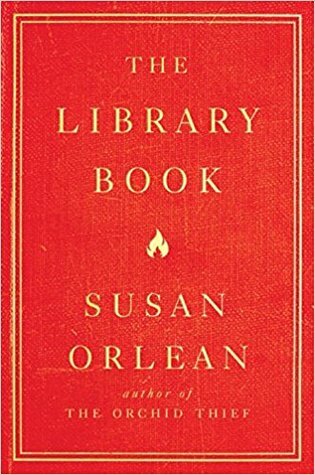 Susan Orlean is another lover of libraries and books, and Orlean’s book, The Library Book, caught my eye quickly. Orlean is a new author to me, and I can’t believe I’m putting that in writing. I should have read more of her work. I understand from one Amazon review I read that “[h]er only peer for nonfiction is John McPhee.” If you haven’t read McPhee and you enjoy nonfiction, you should check out his books and essays. Back to my review. As you’ve learned from the synopsis, The Library Book centers around a fire that consumed the Los Angeles Public Library (“LAPL”) and many of its treasures on April 29, 1986. Investigations into the fire and its cause frustrated police and fire agencies. Investigators focused on one interesting and somewhat intriguing character, Harry Peak. Rather than write about a building, furniture, equipment, books, maps, and other elements of the library, Orlean shares with her readers a living, breathing, and in the midst of the horrific fire, dying soul. She shows us the tiny elements in the life of the library that richly personify it. At the heart were books, but at its soul were staff, people who come and go, children, homeless, hungry, LGBTQ community. And most important, the persons who served as head librarian. We, her readers, come to know the library as a standing affirmation of its service to the community. Orlean accomplishes her personification of LAPL through the use of its history from beginning to eventual demise and rebuilding. LAPL’s restoration included the enormous and intricate task of bringing back to their shelves over 700,000 books damaged by smoke and water. LAPL’s history was enriched by meeting those who served as head librarian, including the disputes over whether or not women were fit and capable of holding that position. Some of the chapters on this subject are comical at times in light of today’s continued and difficult upward movement of women into the management level positions in corporate and governmental America. Many have commented that they felt more attention should have been given to the fire rather than historical facts and materials. In my personal opinion, I believe Orlean structured The Library Book as she did to show the reader the importance of LAPL. In this way, Orlean could affirm the need to work unceasingly as staff and others did to bring it back to life. LAPL was an essential part of the area of Los Angeles in which it resided. To allow it to simply disappear or, worse yet, come back as only half of what it had been would have been a blemish on the library’s history and family. It would have left a profound statement of how unimportant the library was to its patrons. My Recommendation: If you are a lover of books and libraries, you will love The Library Book for all the reasons I’ve shared with you and perhaps some you can share in your own review. Orleans writing is beautiful in many respects and intelligent and well-researched. As a writer, I have found in Orleans’ writing many lessons upon which I will draw. I’m the product of a happy and uneventful childhood in the suburbs of Cleveland, followed by a happy and pretty eventful four years as a student at University of Michigan. From there, I wandered to the West Coast, landing in Portland, Oregon, where I managed (somehow) to get a job as a writer. This had been my dream, of course, but I had no experience and no credentials. What I did have, in spades, was an abiding passion for storytelling and sentence-making. I fell in love with the experience of writing, and I’ve never stopped. From Portland, I moved to Boston, where I wrote for the Phoenix and the Globe, and then to New York, where I began writing for magazines, and, in 1987, published my first piece in The New Yorker. I’ve been a staff writer there since 1992.